Since being knee high to a grasshopper, I have been fascinated by plants. An interest in photography seems to have started quite early also, as shown by a photo of me which my parents took around 1958 - when I was about four - picking daisies and collecting them in a camera case. I am very fond of that photo. 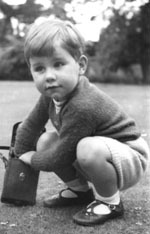 Living close to the countryside and having parents very keen on gardening were both important factors in the early years. But my elder sister, Valerie, also played a big role, particularly in a letter she wrote to me in February 1991. She suggested we collaborate to put our skills and interests together to produce a fitting gift as a thankyou to our mother for her gently helping us acquire our love of gardening and plants in general. But what would make such a gift ? The answer was soon forthcoming - a book on violets dedicated to her, our mother, who's name is Violet. I confess to being a little proud of Valerie's excellence as an artist in watercolour, ink, and other media. She will contribute her artwork, research, and support to the book, whilst also growing and observing violets and pansies in her garden in the far north of Scotland. I have professional roles as a freelance photographer, writer, and computer consultant, plus other acquired skills such as desk top publishing and gardening, and I am a geologist by university training. Fortunately, that is proving to be a very good mix of capabilities to bring to bear upon the book. Our aim is to produce a photographic monograph on species Viola worldwide. To do this well is a big job, there being over 500 species worldwide, distributed from Alaska to Antarctica via temperate lowlands and equatorial peaks. Six years into the research and the maze of interconnected information continues to unravel with ever-increasing complexity like a computer-animated fractal image. So, for practical reasons, like many a major botanical publication, our work may be published in stages. 'Monograph' means different things to different people. To many it is a dry, jargonsome, photo-less tome only to be opened in times of severe sleeplessness (assuming a table of logarithms cannot be found). That same incarnation may be of great practical value to other, more specialized folks. In referring to our book as a 'photographic monograph', I hope to hint at it being aimed between the coffee table and the dusty library archive. That can be quite a chasm, I know; I hope the book does not simply fall into oblivion between the two extremes! I believe I can avoid that disaster. I will write it in such as way as to provide a style and graphic content attractive to the amateur botanist and gardener, yet with enough technical depth and breadth to be of good value to professionals. In fact, one of my hopes is that, through familiarity with the book, the eyes of many an amateur will be opened to the fascination of plants in general (not just Viola), acquiring sufficient momentum of interest to power them into careers as professional botanists or horticulturists. Editors please note: I am interested in writing photographically illustrated articles for magazines with a gardening, botanical or natural history leaning; not limited to Viola. Here's an example featuring Viola elatior. Slides from my photo library are also available for repro. Please phone 01252-316649 or email me to discuss subject matter and repro fees. I have written an article describing a study day held by the variegated plant group of the hardy plant society. It includes an explanation of the various types of variegation, why some variegated plants come true from seed, and many other curious and interesting facts. There is a fairly comprehensive list of organizations more closely concerned with violets and pansies elsewhere on this web site.